Wait! Don’t swat that bee; she may be on a scientific mission. If you’re within five miles of the modest Pacific Biosciences Research Center on the upper reaches of the University of Hawaiʻi at Mānoa, you’re within the range of six hives of honeybees who are revising human assumptions about learning in invertebrates. The bees are drawn to a window box on the second floor of the PBRC building, where the sugar water is far sweeter than nectar in floral foraging grounds. Younger workers may check out the enclosure before sampling the different colored disks inside. Older, more experienced bees make, well, a beeline to the disks, where they complete tests requiring discrimination and memory—should they choose the yellow disk or blue?—to earn their sweet reward. One thing is clear to the scientists patiently documenting the bees’ behavior on initial and subsequent visits: bees quickly learn to make the right choices. "It is no longer heresy to say that learning in a bee may be similar to learning in a rat," says UH Mānoa psychologist and researcher Patricia Couvillon. That wasn’t always so. For decades, psychologists interested in learning and memory studied the white rat as a model for vertebrates. Along the way they developed principles—how reward and punishment work, how factors influence learning, etc.—that were shown to hold true across a range of species. Still, the assumption was that invertebrates (insects, snails and the like) had diverged from the vertebrates so long ago (half a billion years) and have such small and loosely organized brains, that they couldn’t possibly learn the same way. The challenge with invertebrates is to find test subjects that have good sensory capabilities to distinguish rewards, an observable behavior to indicate their response and motivation for participating in the first place. During his two-year stint abroad as a Humboldt Prize scholar, M. E. "Jeff" Bitterman discovered the answer in honeybees. Widely studied in Germany for their role in agriculture, they exhibited the necessary traits for research on learning. A pioneer in the field, Bitterman introduced hives to Mānoa more than two decades ago, contracting with professional beekeepers to tend them and harvest the honey. Retired but still active, Bitterman continues to collaborate with Couvillon, his former graduate student. The scientists retraced Ivan Pavlov’s work on conditioned reflexes with an apian twist. Pavlov’s 1903 treatise holds pretty much verbatim if you substitute bees for dogs, sugar water for meal, odors for bells and thrust tongues for drooling, Couvillon says. Bees, it turns out, will stick out their tongues when a drop of sugar water is touched to their antennae. Pair a peppermint scent with the sugar drop just a couple of times, and the bees will stick out their tongue at a whiff of peppermint alone. A British company is even conditioning bees to signal when they sniff explosives in luggage or on minefields, marketing them as cheaper to keep and quicker to train than dogs. "Bees learn very quickly," Couvillon notes. Their two compound and three simple eyes afford good color vision; bees also sense smell, sound vibrations and magnetic field variations. UH Mānoa honors undergraduate student Maile Cooke demonstrated that bees have working memory—the ability to temporarily retain information (e.g., the yellow disk has the sugar water) much as we remember the phone number we look up long enough to dial. On a sabbatical return to his alma mater, Hiroshima Shudo University Professor Akira Shishimi is finding that a bee’s working memory lasts at least through a trip to the hive and back. 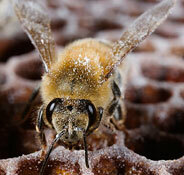 Bees can solve complex "if-then" problems that stymie human toddlers. For these studies, bees are presented with more variables and conditional situations. For example, if they see a triangle, then the sugar water is in the yellow disk, but if they see a circle, then the sugar water is in the peppermint-scented disk. "The bees change their behavior in response to the environment. That’s what learning is," Couvillon says. All animals have to learn to survive. Perhaps the key biological mechanism lies in something else animals have in common—the synapse, where neurotransmitters carry messages between cells. So maybe we shouldn’t be surprised that bees aren’t so different when it comes to learning. Sequenced by the National Human Genome Research Institute, the social honeybee genome has more similarity to the human genome than any insect sequenced to date. Genetically speaking, we have more in common than not. That may be the true lesson of the birds and the bees. A honeybee sprinkled with powdered sugar. Photo by Steve Haynes. 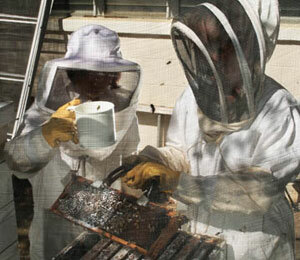 Scientists who use bees as research subjects have an interest in keeping their hives healthy. So when a mite-borne virus that deforms bees’ wings showed up on Oʻahu, Patricia Couvillon sought a solution that doesn’t require mass exterminations or involve pesticides that could interfere with the bees’ performance in learning experiments. Couvillon uses the sugar shake method, periodically dusting the bees in her six hives with powdered sugar. Being scientists, her team keeps track of the number of mites that fall through a screen onto giant sticky traps, either unable to hang onto the sugar-coated beehairs or dislodged as the bees groom. "I think we saved one dying hive using this method," she says. "We’re using this as a demonstration project, in service of our own work, but also as a community service to the beekeepers." It’s no trivial matter. The mites decimated feral bee populations in Florida and spread between the islands of New Zealand despite efforts to keep them at bay. 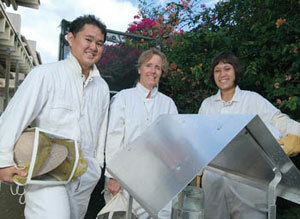 O’ahu farmers depend on feral bees for crop pollination. And on the Big Island, honeybees are an important export industry, not for the honey, but for bee queens still certified as mite-free, which are sold to beekeepers and farmers who need healthy new hives to pollinate their crops. Cheryl Ernst is Mālamalama editor and Creative Services director in External Affairs and University Relations.